What are the Benefits of Polished Concrete Flooring? The stunning, luxurious look and feel of polished concrete floor appeals to a wide range of people with differing interior design tastes. That’s the beauty of polished concrete; no matter what architectural style your property is, a polished concrete floor will compliment your interiors perfectly. 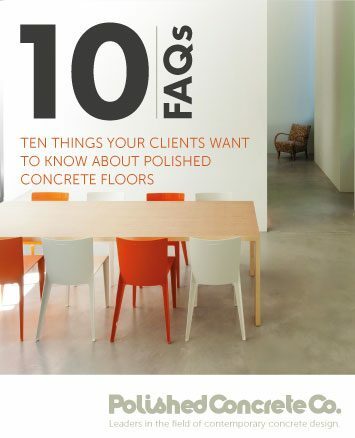 But why would you choose polished concrete over other types of flooring? One of the many benefits of polished concrete flooring is its durability. Although the type of floor will be dependent on the property it will be laid in, all polished concrete floors are incredibly durable. The superior strength and performance of concrete means it doesn’t dent or chip like softer surfaces, such as timber, rendering it an ideal choice for a busy family home. With its durability in mind, it’s easy to see why polished concrete floors were originally developed for commercial and retail environments. However with such beautiful finishes, polished concrete floors fit perfectly in modern homes and will effortlessly withstand the rigours of fast-paced family living. Another huge benefit of polished concrete is that it is incredibly easy to maintain; perfect for busy families, shopkeepers and office cleaners alike. With no joins or edges to worry about, polished concrete floors offer a seamless surface that’s much more hygienic and easier to clean than any other flooring option. In general, polished concrete floors will only require an occasional damp mopping because an internal sealer is applied during the installation. This sealer protects the concrete from the inside out and hardens it, providing a sealed surface that won’t harbour dust, dirt or allergens, meaning they’re the perfect flooring choice for people who have allergies. Although there are several types of polished concrete finishes, whichever you choose will be easy for our installers to lay. Whether you could choose to enhance your current floor with an overlay, turn an existing concrete floor into a beautiful polished floor or install a new polished concrete floor from scratch, the simple installation process means there’ll be no major building work to worry about. One of the fantastic benefits of polished concrete flooring is it offers great cost savings. Simply because of the robust and durable quality of polished concrete, it has an extremely long life expectancy compared to other flooring options. Properly maintained, a polished concrete floor will last for years, giving you a floor you never have to worry about or spend ages cleaning or maintaining again. As you can see, the benefits of polished concrete floors compared to alternative floorings are vast, no matter what style of property you own. If you’d like to find out more about our polished concrete floors or request an estimate, please call 020 84624050, email info@polishedconcreteco.co.uk or contact us via our contact page.